Magazine launched its eleventh issue Thursday, 31st of March 2011 in royal fashion, filling its pages with the rising stars of the modeling world and crowning it with Chris Levine’s intimateportrait of Her Majesty Queen Elizabeth II on the cover. “We’ve devoted our eleventh issue to all that sparkles—and I’m not just talking about jewels,”Raoul Keil, editor-in-chief of Schön! Magazine, said. The cover image is part of an exclusive preview from Schön! 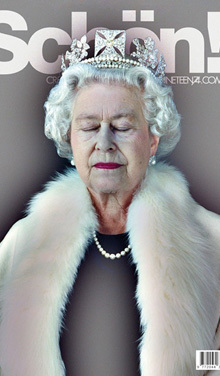 Magazine of the National PortraitGallery’s touring exhibition of portraits to commemorate Her Majesty’s Diamond Jubilee. Keil said he is also ecstatic to present an “elite league of up and coming male models” in Issue 11, including Willy Cartier and Stephen Thompson, who have campaigned for Givenchy, and Sebastian Sauvé, who was featured in the latest Zara campaign. “And you certainly don’t want to miss theenchanting fashion editorial ‘Home Alone’ from the very talented photographer Thanassis Krikis,”he added. And in a nod to Hollywood, also filled with a certain type of royalty, Andre Da Silva talks with actress Lisa Edelstein about winning her first award, Rocio Frausto interviews Oscar and Golden Globe nominated visual effects supervisor Alex Frisch, and Stefan Milev presents a Little Red Riding Hood-inspired fashion shoot to coincide with the upcoming film. “We’ve filled our pages with the crown jewels of the creative world,” Keil said. “This issue issimply sparkling with our most dynamic and diverse array of talent yet. Zohra Bakhsh atteam@schonmagazine.com or +44 (0) 207 631 0797, or visit www.schonmagazine.com.